At the end of a busy bank holiday weekend, it felt rather odd to be going to a game on the Monday evening. You certainly had to feel sorry for the Liverpool fans who would get home in the early hours with work beckoning in the morning. I don’t live far from Watford, but even I booked a hotel room for the convenience. Imagine my surprise when the receptionist asked whether I was here for the football and who I was supporting. I thought I would be fine when I assured her that I was a Watford fan. Instead I was told, in no uncertain terms, that if I was a proper Watford fan I would live locally rather than being ‘posh in Windsor’. I found myself begging forgiveness on the basis that I had moved west for work. As always when the schedule is messed with, I had no clue what time to arrive at the West Herts. For once I judged it right. The food menu for the evening had a Caribbean influence. I briefly considered the goat curry, but couldn’t resist the jerk chicken. Although I should have asked for the rice and peas instead of the chips that accompanied the chicken. It certainly made a welcome change from the usual bacon/sausage in a roll. After the results at the weekend, the only team currently in the relegation zone who can still catch us are Swansea. They would have to win all of their remaining games, which sounds like a tall order but, before the match, I heard more than one person predict that they would overtake us in the table. I am starting to think that I am becoming very complacent. Team news was just the one change from Hull with Mariappa replacing the injured Holebas. So the starting line-up was Gomes; Mariappa, Prödl, Britos; Janmaat, Cleverley, Doucouré, Capoue, Amrabat; Deeney and Niang. The first chance of the game came in the fifth minute as, following a rapid passing move, Niang found space for a shot but fired it straight at Mignolet. Klopp was forced into making an early substitution as Coutinho, who had been injured in an earlier challenge with Mariappa, was replaced by Lallana. 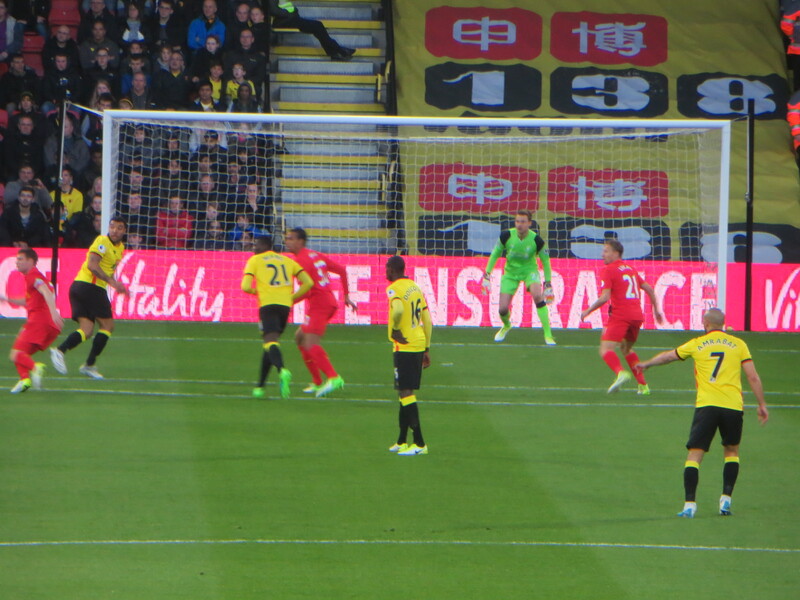 Watford threatened again as a lovely move finished with a shot from Deeney that was blocked. Mazzarri was also forced into an early change as Britos went down injured before limping off to be replaced by Kabasele. The first chance for the visitors came after 20 minutes as a shot from distance by Can was met with a one-handed save from Gomes. The next Liverpool attack came to nothing as Origi reached the by-line before cutting the ball back into the arms of Gomes. 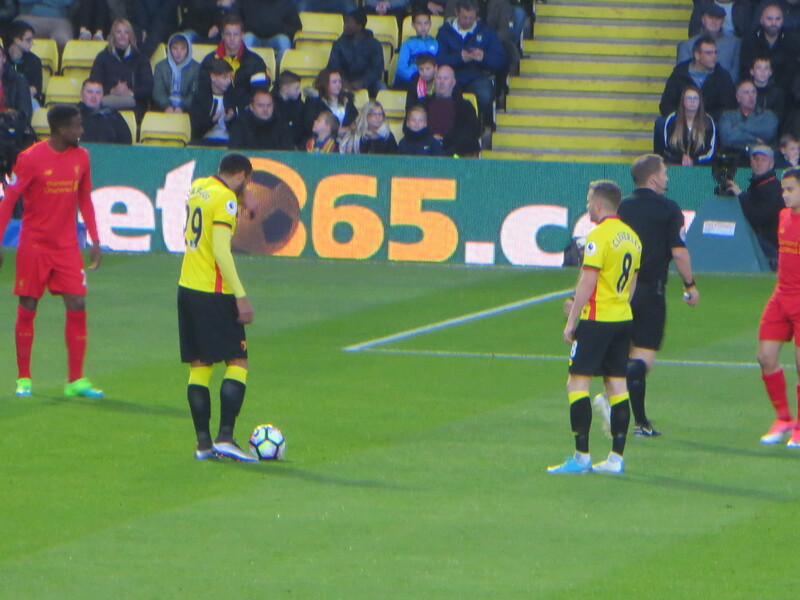 There were hopeful shouts for a penalty from the Vicarage Road faithful when Deeney was knocked over in the box but he quickly got up and nothing was given. The referee had been rather flaky, with many decisions appearing to be given according to the volume of protest in the crowd rather than any severity of the offence, so he incurred the wrath of the Rookery when a corner, that appeared to be awarded as an afterthought, nearly led to the visitors taking the lead as Gomes punched the clearance only as far as Lallana whose shot hit the crossbar. There was hilarity mixed with anger as Lucas went down on the edge of the box with the most obvious of dives and was booked for his trouble. In time added on at the end of what had been a very dull half, Lucas chipped the ball to Can who hit a superb overhead kick to open the scoring. Apparently it is the best goal he has ever scored, with pundits declaring it one of the goals of the season. It was totally out of place in this game. 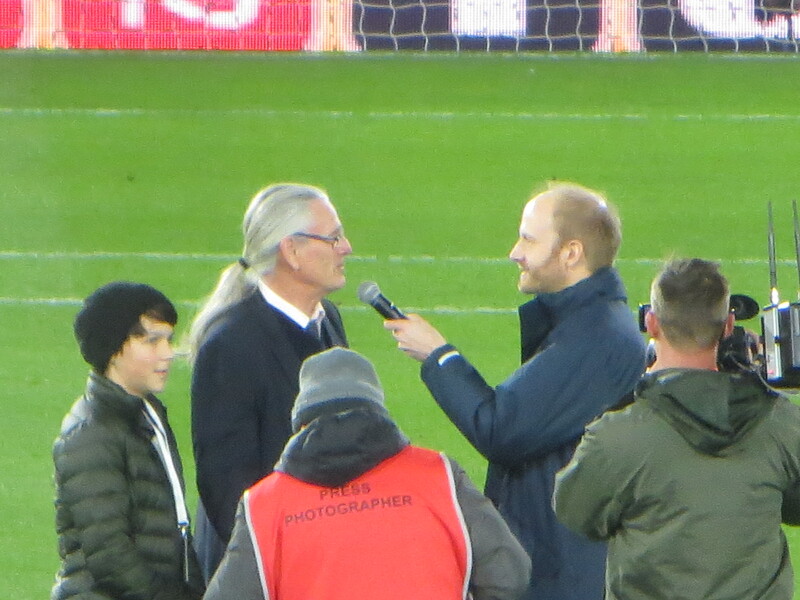 The half time interviews on the pitch couldn’t have been more different. First lovely Rene Gilmartin appeared with his wife, Emma, talking about the Ross Nugent foundation http://rossnugentfoundation.ie/ which was set up in memory of Emma’s brother, who died at the tragically young age of 18, with the aim of helping cancer sufferers and their families at the hospital where he was treated. The next to make an appearance was Ross Jenkins. When asked what it was like to step on to the grass of the Vicarage Road pitch again his response was, “I don’t remember the grass being this good.” He also said how poor he had been when he first broke into the Watford team but hoped that he had done all right in the end. I think the reaction of the crowd assured him that he had. He was accompanied by his grandson who had come over from Spain to watch some Premier League football. Sadly the first half was enough to give the poor child nightmares. Buoyed by the goal, Liverpool started the second half really well. The first chance came from a Milner free kick from the edge of the area which was saved by Gomes. The Watford keeper was in action again soon after as Origi tried a shot from distance, but Gomes was able to push it round the post for a corner. The Belgian threatened again, breaking into the box to shoot, but Gomes again made the save. 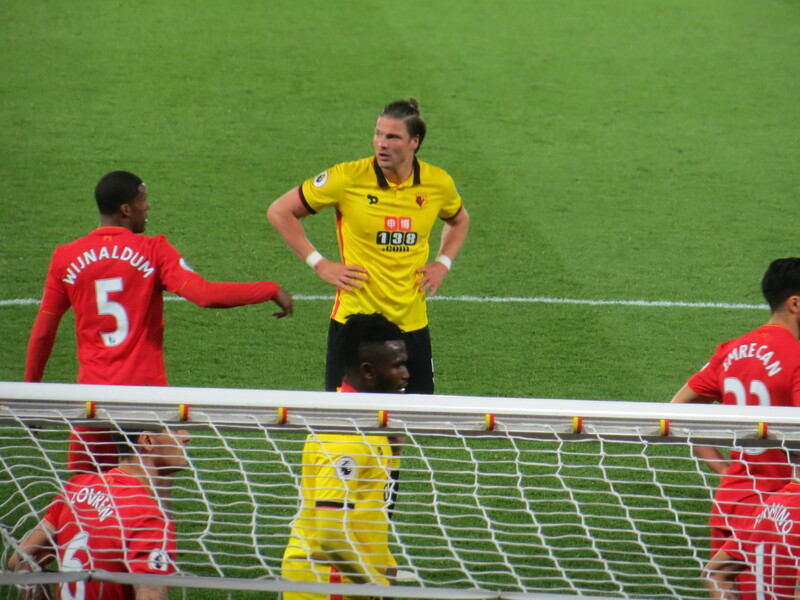 Watford had been on the back foot for the first 20 minutes of the second half, so it was a relief to see them on the attack. When Janmaat beat Clyne on the wing, he appeared in two minds about what to do next. In the end he hit a decent cross, but it was easily gathered by Mignolet. Watford came close to an equaliser as an Amrabat shot was blocked, the ball fell to Capoue outside the area who hit a lovely dipping shot that Mignolet did well to tip over the bar. Sadly the referee appreciated neither the shot nor the save as he awarded a goal kick instead of a corner. This infuriated Capoue, who was booked for his protests. Amrabat threatened again, this time with a cross that was gathered by Mignolet. 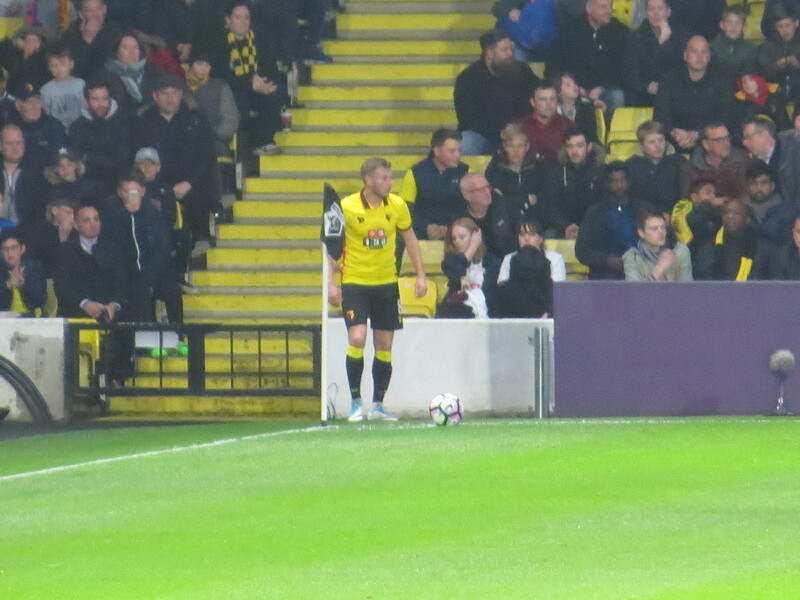 Mazzarri’s second substitution came on 72 minutes with Success replacing Capoue. Janmaat had a great chance to equalize as he surprised Mignolet with a shot that the Liverpool keeper was just able to keep it out. There was a rash of late substitutions as Origi and Lallana (who was a sub himself) made way for Sturridge and Klaven for the visitors and Okaka replaced Amrabat for the home side. In the 90th minute, Liverpool had a great chance to seal the victory when Sturridge shot from the edge of the box but, yet again, Gomes kept it out. Watford could have won a point in time added on as Prödl volleyed goalwards but his shot cannoned off the crossbar and the visitors left with all three points. The post-game reaction was very mixed. Some had enjoyed the game and were happy enough with a narrow defeat, particularly as the goal was an unstoppable strike. Others, as has often been the case of late, were frustrated with Mazzarri’s defensive tactics arguing that, given Liverpool’s inconsistency, this may well have been our last chance to gain points this season so we should have been trying to win the game. I think that is doing Liverpool something of a disservice given their lofty position in the table. My position fell somewhere between the two, certainly an attacking end to the game goes a long way to sending me home happy, but it also makes me wonder why we can’t take that approach earlier in the game. Having been brought up on GT’s brand of football where the aim was to score more than the opposition, I hate to see teams set up to stifle play. So, as the season winds down, I can’t help feeling rather sad that, despite having spent most of the season comfortably clear of the relegation zone, a large proportion of our fans are both bored and frustrated. I wonder whether this would still be the case if Mazzarri’s approach to games was more attacking or is this what mid-table obscurity in the Premier League feels like? 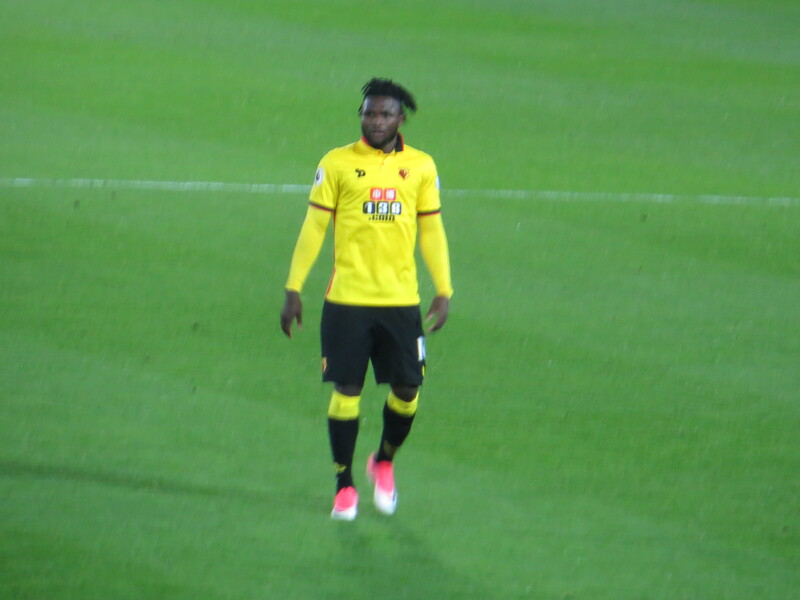 This entry was posted in Watford FC and tagged Abdoulaye Doucoure, Adam Lallana, Adrian Mariappa, Christian Kabasele, Daniel Sturridge, Daryl Janmaat, Dejan Lovren, Divock Origi, Emre Can, Etienne Capoue, Georginio Wijnaldum, Heurelho Gomes, Isaac Success, James Milner, Joel Matip, Jurgen Klopp, Liverpool FC, Lucas Leiva, M'Baye Niang, Miguel Britos, Nathaniel Clyne, Nordin Amrabat, Phillippe Coutinho, Ragnar Klavan, Roberto Firmino, Sebastian Prodl, Simon Mignolet, Stefano Okaka, Tom Cleverley, Troy Deeney, Walter Mazzarri, Watford FC on May 3, 2017 by franelynn.